Monica Bonvicini is a Berlin-based artist who has rocked the visual arts community for decades. Her substrates, like her context, have no boundaries. Her pieces, “…investigate the relationship between architecture, power, gender, space, surveillance and control—is translated into works that question the meaning of making art, the ambiguity of language, and the limits and possibilities attached to the ideal of freedom,” she describes. Each artwork is more different than the one before offering a surprising installation at every exhibition using LED tubes, concrete, cardboard, electrical wire, wood, fabric or even mirrors, her unique composition continues to impress the visual-minded masses. 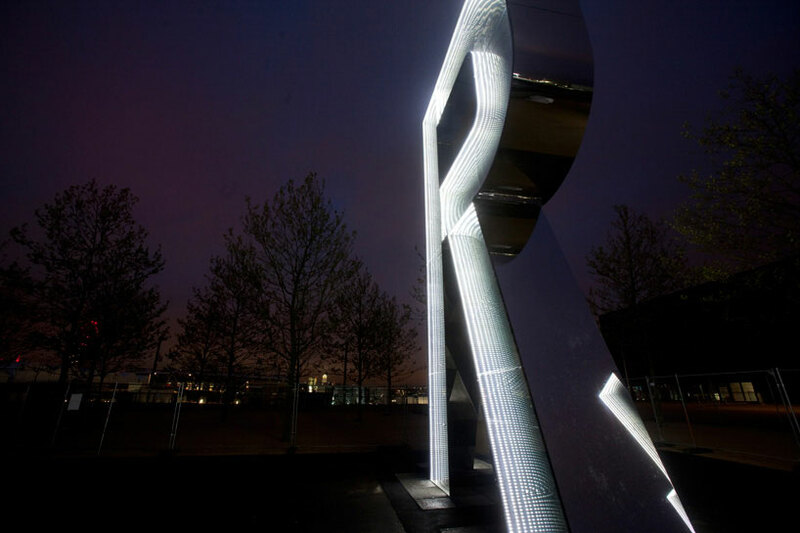 Back in 2012, Bonvicini was awarded a commission to create a cultural art piece at Olympic Park. Her creation was a 30-foot sculpture inspired by the songs of musical icons. Spelling out the word “RUN” the artist formed the foundation of the piece with the songs of Bruce Springsteen (Born To Run), The Velvet Underground (Run Run Run) and Neil Young (Running Dry). 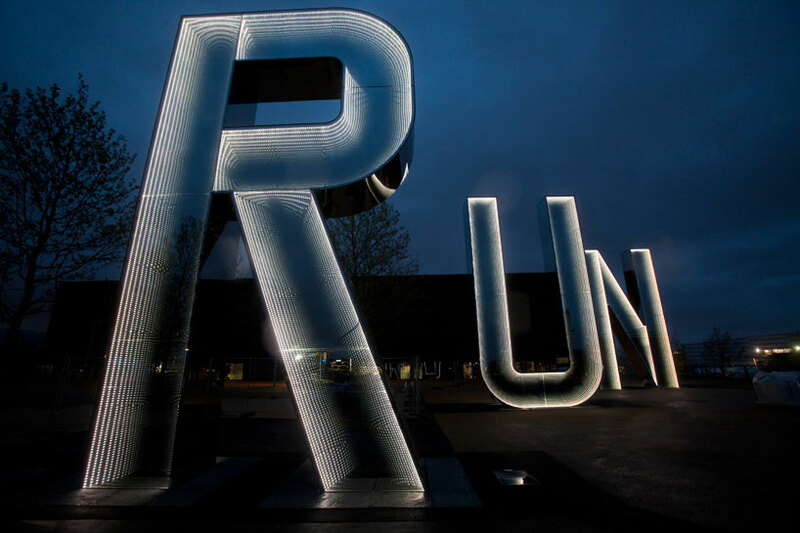 The mirrored letters interact with their surroundings reflecting the sun and passersby. The mirrored effect virtually disappears at night when the letters become translucent and utilize LED lighting to offer another element of dimension. The letters used an abundance of materials including 12mm ESG white-glass with IpaChrome coating, PVB Foil, 10mm TVG white-glass; mirror Dibond, stainless steel, stainless steel cover (with mirror polished surface), and high-performance-LEDs. 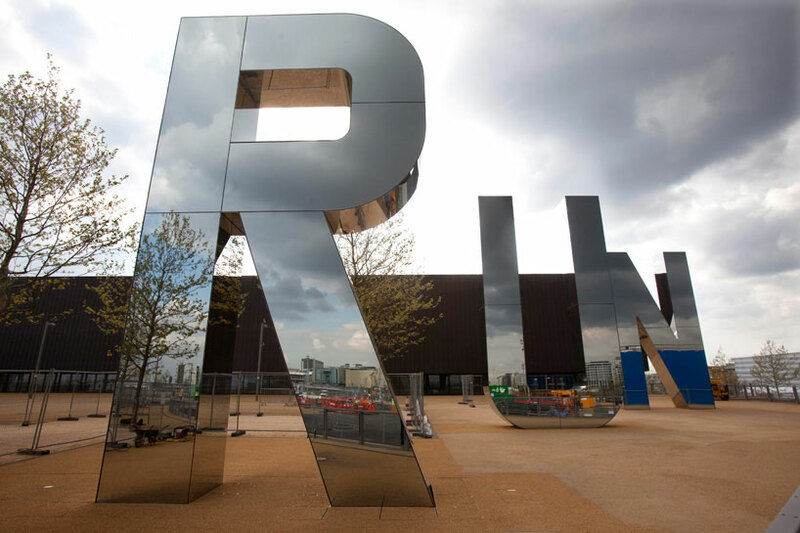 Although the piece was the framework of the London Olympic Games in 2012, it is a permanent outdoor structure at the Queen Elizabeth Olympic Park in London, England.